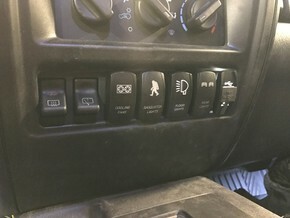 This model has 3 OEM TJ/XJ switch ports and one aftermarket power point. The power point is all the way to the right, and the switches are all the way to the left. 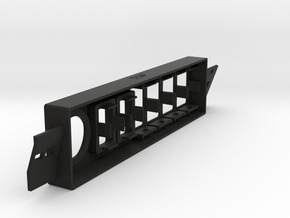 You can either use factory switches or aftermarket OEM-style TJ/XJ switches, except the Rubicon Axle Lock switch--they are significantly wider than other switches. 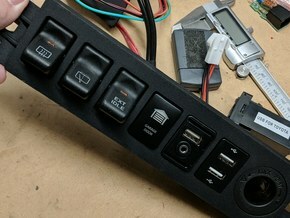 eBay and Amazon have several listings for aftermarket switches. You will need to buy a power point similar to the ones below--the OEM power points will not fit. The blank space can be drilled out to make room for less-expensive standard switches.